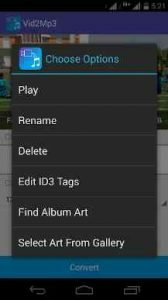 Vid2Mp3 : Using video to Mp3 you can easily extract audio from any video you have. You can extract the audio and save it to any folder of your choice and listen later. You can even add meta tags to the audio such as Album art, artist and album information. Does one thing extremely well, so if you want to record stereo audio but your hardware won’t let you, take a movie of it then rip the audio as an mp3 with this. Works great. I love it but one probs d video converted only frm ur gallry u have.. I need to directly from link.. If possible plz improveit… Den I give 5..
Probadly the fastest video to mp3 converter, you can find in google playstore,it is unbelivable that it converts a 10 hour video in just 10 minutes,this is insane,it is the only app that has real deal with it,I think so.